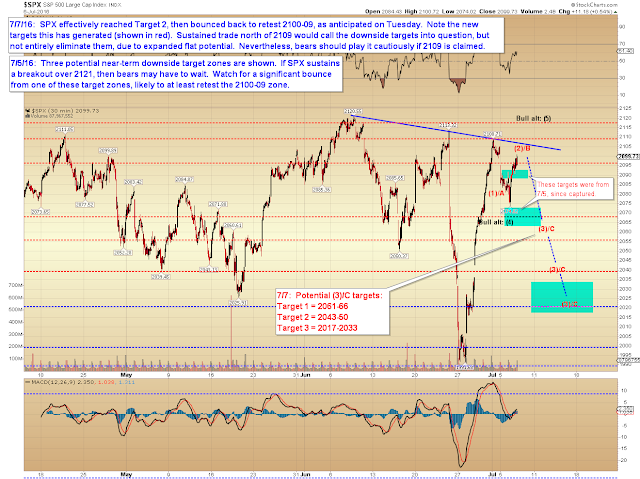 I am presuming the rally is due for a pause (or worse), and on Friday, I discussed a real-time short entry on our private forum, at ES 2100... 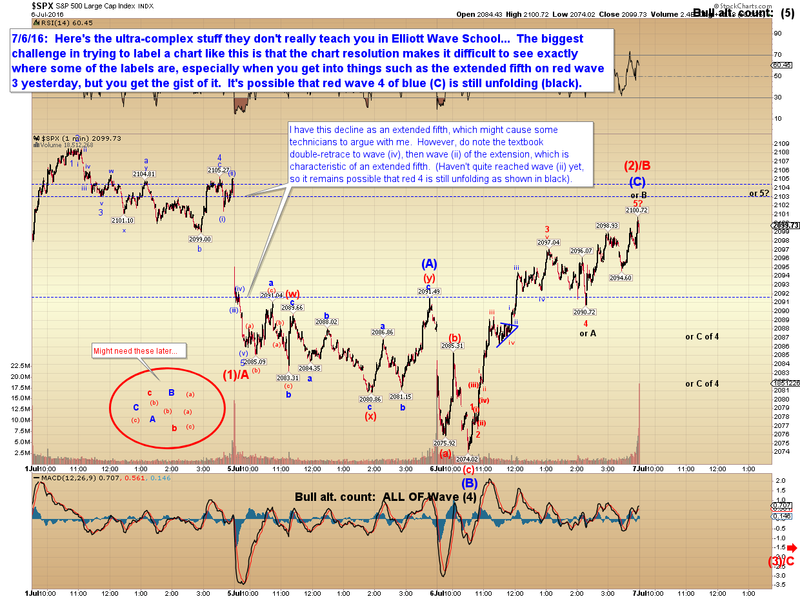 I still do not feel the market is correctly positioned for a large intermediate rally [note: "do NOT feel" -- a few readers read that another way]. A brief head-fake higher wouldn't surprise me one bit, but even that isn't guaranteed -- bears have, so far, held 2113 SPX, which keeps the most bearish options on the table for now. 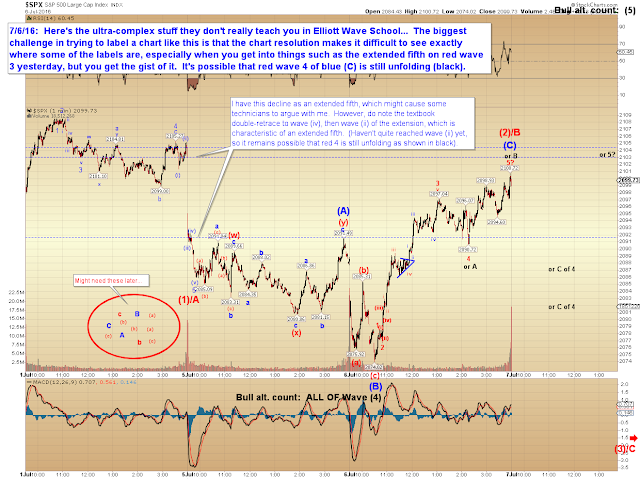 If SPX develops a decent-sized impulsive decline, then we'll know to keep looking lower for another wave down to follow. The bigger news, though, is that the decline does appear to be impulsive, which suggests at least one more leg down after the current bounce completes. For whatever reason, there's something bothering me ever so slightly about the impulsive appearance of this decline, but I can't put my finger on it, so it may be nothing. However, let me take this as an opportunity to suggest that bears avoid arrogance and manage their risk, despite the expectation that the market will see another leg down before having a more serious shot at a lasting rally. In conclusion, the decline from 2108 appears to be an impulsive waveform, which is as much of a green light as bears ever get after a blistering snap-back rally like the one that began at 1991. 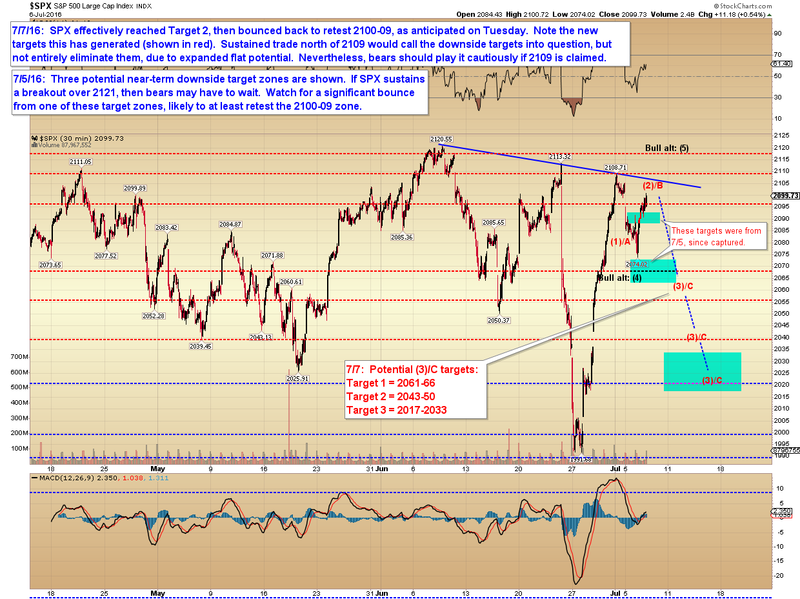 Accordingly, we have three downside target zones, AND the possibility that 2108 marks a more meaningful top. In the event that bulls can sustain a break out over the 2109 level, then we would have no choice but to rethink that, of course, although 2121 is still the more significant level. Trade safe.